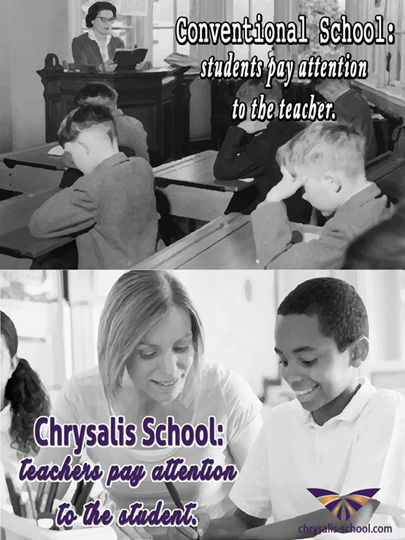 Chrysalis School will create a learning environment where students engage in a course of study that meets their needs, interests, and abilities so that they will be successful, confident learners. “Once upon a time the animals decided they must do something heroic to meet the problems of a “new world” so they organized a school. They had adopted an activity curriculum consisting of running, climbing, swimming, and flying. To make it easier to administer the curriculum, all the animals took all the subjects. The rabbit started at the top of the class in running but had a nervous breakdown because of so much makeup work in swimming. The squirrel was excellent in climbing until he developed frustration in the flying class where his teacher made him start from the ground up instead of the treetop down. He also developed a “Charlie horse” from overexertion and then got a C in climbing and D in running. The eagle was a problem child and was disciplined severely. In the climbing class, he beat all the others to the top of the tree but insisted on using his own way to get there. At the end of the year, an abnormal eel that could swim exceedingly well and also run, climb, and fly a little had the highest average and was valedictorian. Taken from the book, Creating Emotionally Safe Schools, by Jane Bluestein, Ph.D.